This beloved IS the beginning of walking in Kingdom ways and how it is in Heaven… I encourage you to read this slow, repeat and meditate upon it! God “created”….Who was and IS “God”? In other words, WHO was with Heavenly Father when HE created? The Spirit…and Who else…THE WORD! EVERYTHING ever spoken out of the MOUTH of God made into verbal words were IN Jesus Who was and IS “THE WORD”! Here is the kicker beloved ones…if YOU DO NOT KNOW “the WORD” you cannot know what the Father speaks because if you don’t know the Word you cannot know Who He is, how He operates, and what His plans are for all mankind and this earth! He gives us things we do not know by revelation only if we KNOW Him through the WORD! The WORD is to “open the door and make a way” because HE IS THE WAY and HE IS THE DOOR! Just look in John where JESUS…the Word said it! This is not hard beloved but has been hidden and only for those with eyes to see and ears to hear by the Spirit of GOD will actually “get this”. Many will read through this and never really get the profound message in it. This is where unrenewed minds won’t be able to “receive” this by revelation and with the wisdom and understanding of GOD through Holy Spirit. YOU first have to have a relationship with THEM! If you don’t have a relationship with the One Who IS the Word, then most likely you are doing just what those whom Jesus addressed did. Pour over them and investigate them…all the while, reading “through them” and it makes for great reading and intellectual knowledge but it doesn’t take the place of relationship. If you read them with the heart to “know” HIM…and open like a child to allow Holy Spirit to teach and speak to you about Him…HE will! You cannot speak the WORD relationally if you don’t HAVE an authentic relationship with JESUS/Holy Spirit /Heavenly Father… the Door is through JESUS by Holy Spirit to really go boldly before the Throne of Heavenly Father! When you KNOW the Word by Jesus as in manifested REAL relationship and the written Word of Jesus you begin to “change” and be “transformed” BY Him by IT as Holy Spirit brings your thoughts, words and actions INTO right alignment so you can seek FIRST His Kingdom AND….AND…His righteousness! Look at it this way…what goes in, comes out! Jesus said out of the heart the mouth speaks. If you read in the Word and believe, then you speak what you believe. Not only that, you will conform your lifestyle …the way you behave or act accordingly. How does this relate to “only speaking what the Father speaks”? Again, if the WORD isn’t IN YOU…how do you even know how HE speaks? HOW do you know His personality? The way HE does things? You cannot really know. IF you know the WORD…then when a “NEW FRESH REVELATION” comes…you “know” His personality more and “how” He does things and more about HIS heart for people and His earth! If you begin speaking out of your own soul…things you THINK God says and you don’t even spend time in the WORD to “know HIM”…you may be presuming and saying what we call “soulish prophesy”. Meaning it is based upon what is in YOUR soul and not coming FROM God. You may “know the Word” as in having memorized it and speak that out to suit your need for self-gratification to be approved or not rejected by men…again, this is “soulish” prophesy and NOT true revelation that is being prophesied. Well, how do you know the difference when you are the one speaking? It is ALWAYS a “matter of the heart” because it is always connected to authentic relationship! 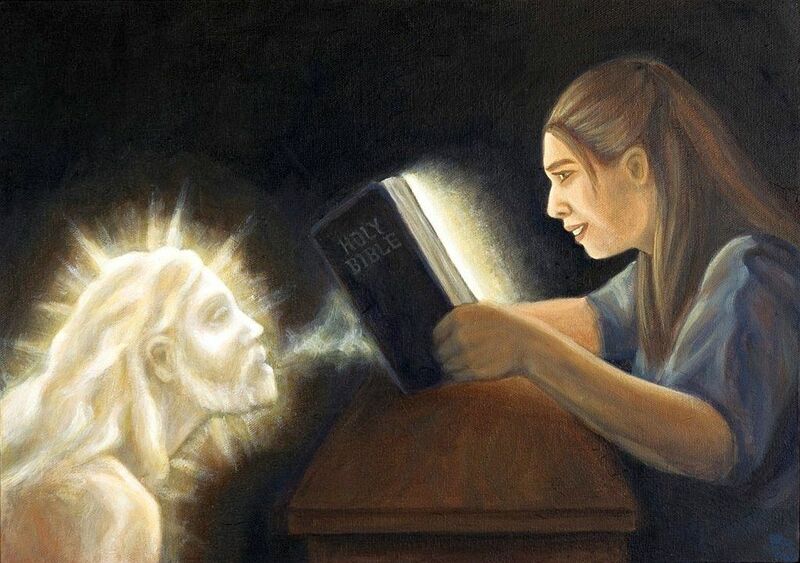 When you know the Word because you are hungry to KNOW THEM… Heavenly Father, Jesus and Holy Spirit, then when you read it, there IS revelation of Them TO you about Who They are and how they act and think. So when you “hear” that still small voice you know if it is something you have read in the Word that indicates the Who, How and What of the personality of Heavenly Father, Jesus and Holy Spirit. When you hear things that don’t line up with “WHO THEY ARE”… then it is safe to say the enemy is probably whispering things and guess what? He likes to use scripture! OH NO…then how can you know the difference? When you learn the heart of GOD! It starts with YOUR own heart! You will only speak what the Father speaks when you actually know what it is HE DOES speak! When you know from reading, meditating and experiencing Him in the Word! Supernatural experiences take place from the place of listening and meditating upon the WORD because the WORD ….JESUS…IS THE DOOR! The word “door” there is the Greek word: thura meaning- entrance; portal! The word “in” means IN and the word “out” means OUT… and the word “pasture” is like food… a place to be nourished…ever hear the phrase “food for the soul”? Your soul prospers through mediating and experiencing GOD the Father, Son and Holy Spirit! JESUS says HE IS THE PORTAL! In and out is quite literal because the word “out” has the connotation of motion! You go in with purpose (part of the meaning of the word “in”) and come out changed, renewed to be able to spread abroad this good news of the KINGDOM of Heaven! OF GOD! When you KNOW HIM….you recognize what He says… the more you “know” Him, the easier it is to spot a word that actually is from Him or not. For yourself or from others because you grow in HIS wisdom and discernment through revelation OF Him. The more you desire to KNOW Him and don’t want to do anything to hamper your relationships with Him…Father, Jesus and Holy Spirit, then you begin to have the “fear” or “awe” of GOD! ONLY knowing the Word is not “knowing Him” meaning…like the Pharisees we saw earlier…they poured over scriptures thinking that alone would bring them what they desired…eternal life. Remember how JESUS described eternal life? To only “speak what the Father speaks” is to KNOW what He has said… so that WHEN you hear that still small voice, you recognize it by knowing HIS character! Knowing HOW He operates…HOW HIS KINGDOM operates! He was and is the way TO Heavenly Father into HIS Kingdom and HE is the Truth and Life that sent the very SPIRIT of GOD back TO us to “speak to us”! HOLY SPIRIT!!! JESUS discloses the ONE WHO speaks TO us and tells us things so that we “only speak what we HEAR the Father speak”! However….if you don’t know JESUS…or the “WORD” Who IS Jesus as well….how on earth can you know what the Father says and about HIM? You cannot! Spirit of GOD reveals HIM to us as we read AND meditate (meaning saying it aloud and thinking upon it…HIM). When people first come to JESUS one of the first things that generally happens is they want/desire to know Him more and they do what? READ THE BIBLE for themselves! BIBLE alone is just written words that can be powerful if the heart is willing to hear and to believe. Faith comes by hearing and believing….which leads to “doing”! TO sum this all up….if you don’t have the WORD IN YOU…you cannot really KNOW the character of Heavenly Father, Jesus and Holy Spirit and you won’t have a plumbline to know if what you think you hear is actually FROM Him! By the same token…if you don’t have a “relationship” with Them, then when you read the Word, it may not make sense to you and will be nice words with meaning to them. This is where the rubber meets the mat… you either KNOW Him or you don’t! Believing in JESUS with your heart is the salvation point…KNOWING Him is learning OF Him and experiencing Him. When you desire to KNOW Him… you WANT to do what is pleasing to Him and Heavenly Father and Holy Spirit…JESUS will show Himself and manifest (so you can experience Him and His presence) when we love Him like that! THEN…beloved, you WILL “only speak what the Father speaks” because you understand what HE is doing because you actually KNOW His character. That is why those who understand declarations and decrees do it with power because they have taken time to “know” Him. Some might be presumptuous but you know our Heavenly Father is always GOOD and if we “miss it” HE is ready to forgive and let us “try again”!! Always be child like and easily corrected and moved by Holy Spirit and you won’t go wrong! HE will teach you and lead you… it is a promise from our Father and Jesus said so!